The full moon in the holy month of Gunla is when Buddhist Newars have flocked to the bahals of the Valley to listen to priests read ancient sacred scriptures. The teachings of Lord Budda is in a book written in gold and silver letters in the sacred texts of Pragya Paramita. 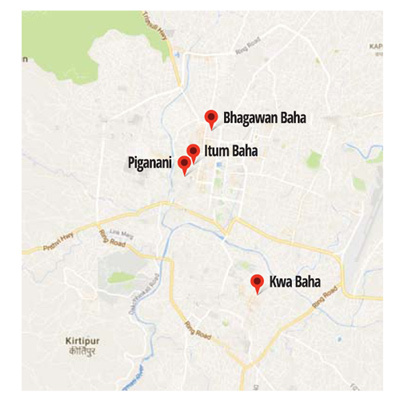 The four known places that house the important texts are Bhagwan Bahal, Itum Baha and Piganani of Kathmandu along with Kwa Baha of Patan (see map). Each of the books with identical stories were written during different times, and there are different rules governing their ritual public readings. The four volumes in Bhagwan Bahal, for instance, are displayed during the festival to be read by the priests. This is the monastery looked after by the Pradhans, the only Buddhist seshya (Newar administrative class) of the valley. The other monasteries are usually managed by Shakyas, Bajracharyas and Tuladhars. 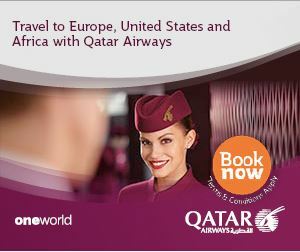 Different venues have different practices during Gunla. The text in Itum Baha is no longer read and is only kept on display with the members collectively reading a printed version in Devnagari every evening throughout the holy month. 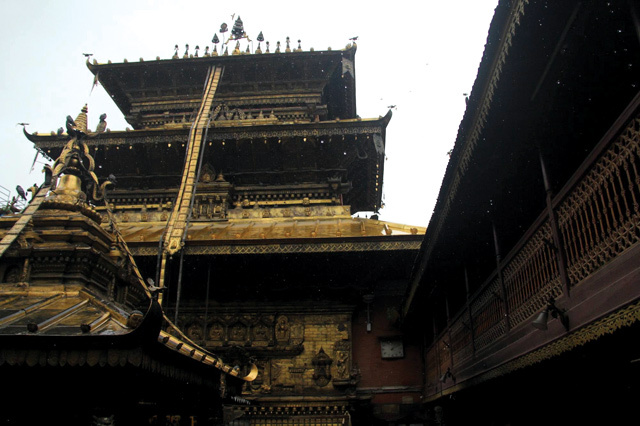 Although it is one of the oldest and most important monasteries in Kathmandu, the tradition of reading the original text was probably lost because of squabbles among priests. 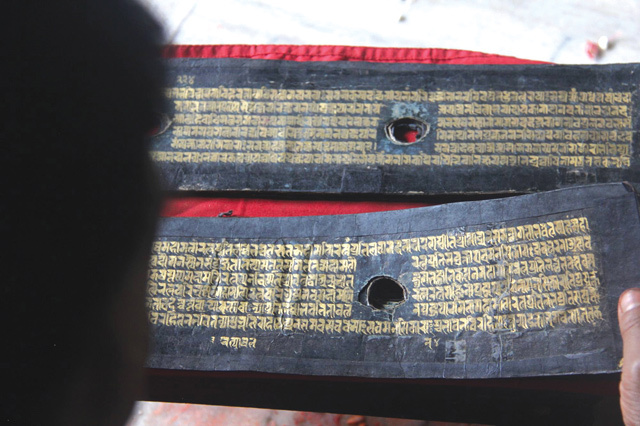 The book in Piganani, a courtyard of the Tamrakar community, is only brought out on the day of Panchara in Juga Chharey, the annual alms-giving event that falls on the 14th day of the dark half of the month. Probably the most easily accessible and best preserved is the one in Kwa Baha where the members of the monastery wait for their turn for as long as eight months to have the priests read the book in their names. 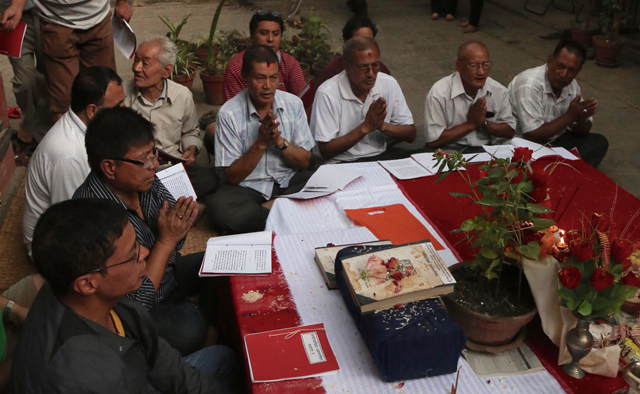 The tradition of book reading is thought to have started 400 years ago during the time of Kulapad Bajracharya of Nyakhachuka, who had six sons: four from the first wife living in Nyakhachuka and two from the second wife in Tangal Baha along with one priest in Kwa Baha reading the script. The text in Kwa Baha. Later on, the Kwa Baha guthi decided to add three more priests making it easier to distribute the 300 page book among themselves. Although the text was initially only read at certain times of the year, nowadays it is read for almost as many as 300 days. The books are not in constant use and the priests use the month of Purshottam Mas (the leap year month according to the lunar calendar) to restore and rewrite the document. The few gurju priests who know the script get the job of restoring the books, and the gold ink is donated by the community. One of the main reasons for the inaccessibility of the Pragya Paramita books is the fear of losing it. The one at Bhagwan Bahal is dated back to 1223 BCE, and the Piganani book is almost as old. The books at Itum Baha and Bhagwan Bahal are written in gold and silver letters while the one at Piganani is written in banana leaves. The fragility and value of the books means that they are kept away for safekeeping, read and are read only during Gunla so they aren't handled frequently. But what the guthis are overlooking is how accessibility helps in preservation and promotion of the tradition, as shown by Kwa Baha. All the books in the four monasteries are in Sanskrit language, and use the Ranjana Lipi script. 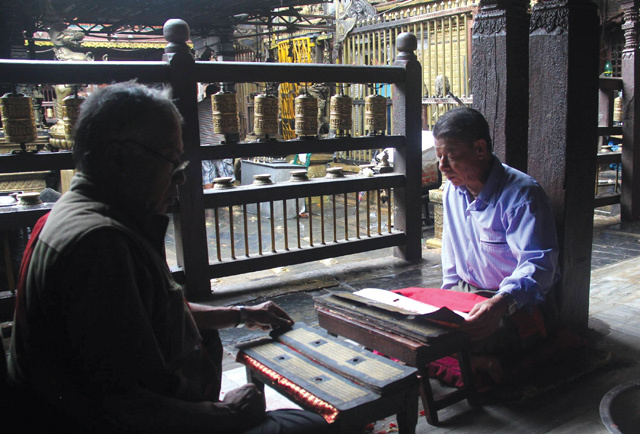 Knowledge of Sanskrit and Ranjana opens many doors for the gurjus to learn about the traditional art of Kathmandu Valley. At the same time, the daily practice of reading the Pragya Parimita at Kwa Baha provides extra economic support to the priests and the guthis. The Bhagwan Bahal guthi has found a novel fund-raising idea: It charges at least Rs 3,000 from everyone who wants to get a glimpse of the holy book. Guthi member Gehendra Pradhan says the book is wiped clean with a ball of cotton once a year, and rules out getting a digital scan of the book. “The older generation of the guthi believe that the book would lose its tantric powers if we did that,” he explains. The guthi denied the Department of Archaeology permission to microfilm the sacred text. But there is public clamour to make the holy texts more accessible to its people, and to copy them in case of damage which would also aid researchers of Pragya Paramita. 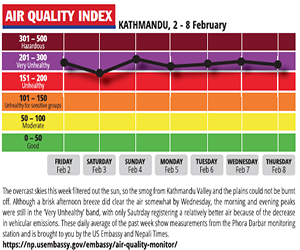 The best way to preserve Kathmandu’s living heritage is to allow the public to participate and enjoy the traditions. So, the more we use the Pragya Paramita, the more we contribute towards its preservation for the future generations. The monastery courtyards and clan yards of Kathmandu Valley are called baha or bahi. The term Baha or Bahal is derived from the Sanskrit word, vihara, which means a Buddhist monastery, according to late Jesuit historian, John Locke. The chief difference between baha and bahi is the infrastructure and location. Bahas are located in a residential area, while bahis are built over a raised plinth and are not residential. This is one of the holiest months for Buddhist Newar community that falls from the new moon of Shrawan to the new moon of Bhadra (September). During this month, Newars visit different bahaas and bahis, play Gunla Bhajans, read holy scriptures and fast. Many other important events like Pancha Daan and Mataya also fall in this month. The term translates into ‘perfection of wisdom’ and is one of the important scriptures in Mahayana Buddhism. Its practice is said to be the essential elements of the Bodhisattva Path. There are various editions of Pragya Paramita: the Kwa Baha (pic), Itum Baha and Piganani editions are the Ashta Sahashrika Pragya Paramita, meaning they have 8,000 stanzas. The book at Bhagwan Baha is said to be Satasahashrika Pragya Paramita: 10,000 stanzas.